Anti-war protesters rally together in Washington DC at a demonstration about the killings at Kent State. The best way to make sense of Rorty’s argument is to follow it chronologically. He sees the American left as split into two camps: the reformist left and the cultural left. The reformist left dominates from 1900 until it is supplanted by the cultural left in the mid-1960s. The division has more to do with tactics than it does principles, but those tactical differences, for Rorty at least, carried enormous consequences. Here’s the case he made twenty years ago. 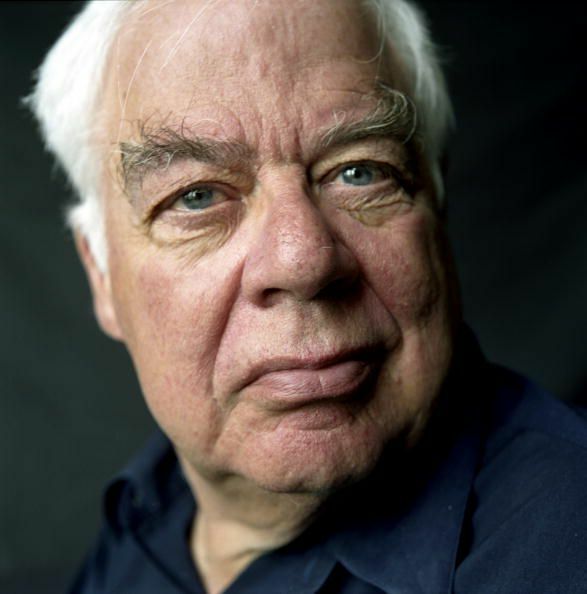 American philosopher Richard Rorty (1931 – 2007) in Oxford, May 7, 2003. “I propose to use the term reformist Left,” Rorty wrote, “to cover all those Americans who, between 1900 and 1964, struggled within the framework of constitutional democracy to protect the weak from the strong.” The emphasis on constitutional democracy is paramount here. Reformists believed in the system, and wanted to improve it from within. Before the 1960s, the American left was largely reformist in its orientation to politics. Think of the people who engineered the New Deal or the Ivy-educated technocrats that joined Kennedy in the White House. John Kenneth Galbraith, the liberal economist and public official who served in the administrations of FDR, Truman, Kennedy, and Johnson, is a favorite of Rorty’s. These were the liberals who weren’t socialist radicals but nevertheless worked to promote the same causes within and through the system. They were liberal reformers, not revolutionary leftists, and they got things done. The reformist left was a big tent. It included people who thought of themselves as communists and socialist as well as moderate left-of-center Democrats. What united them was a devotion to pragmatic reform; there were no purity tests, no totalizing calls for revolution, as was common among Marxists at the time. But they were “feared and hated by the Right” because they gave us the fundaments of the modern welfare state. The reformers had their flaws. FDR, a classic reformist liberal, delivered the New Deal and encouraged the growth of labor unions, but he also shamefully ignored the interests of African Americans and interned Japanese Americans during WWII. Lyndon Johnson did as much as any president to improve the lives of poor children, but he also doubled down on the unjust and illegal war in Vietnam. The Harvard technocrats in the Kennedy administration were complicit in countless horrors in Vietnam. But they also created lasting domestic policies that advanced the cause of social justice. Rorty admired the reformist left both because they were effective and because they understood that the key dividing line between the left the right in this country was about whether the state has a responsibility to ensure a moral and socially desirable distribution of wealth. The right rejected this proposition, the left embraced it. The reformist left “helped substitute a rhetoric of fraternity and national solidarity for a rhetoric of individual rights.” They proposed a counter-narrative to the libertarian right, which fetishized the individual and made a virtue of selfishness. The idea was to convince Americans that America was best — and closest to its moral identity — when it turned left, when it sacrificed, when citizens imagined themselves as participants in an intergenerational movement. Such an orientation didn’t entail a blind spot for America’s sins. “America is not a morally pure country. No country ever has been or ever will be,” Rorty wrote, but “in democratic countries you get things done by compromising your principles in order to form alliances with groups about whom you have grave doubts.” The left made tremendous progress in this way. It accepted, as Rorty put it, that the inequities of American society had to be “corrected by using the institutions of constitutional democracy.” And that meant acquiring power, taking control of institutions, and persuading people with whom you disagree. It was not enough to speak truth to power; elections had to be won and coalitions forged if you wanted to get things done. This spirit of pragmatism held the American left together until the 1960s. The focus was on improving the material conditions of Americans by winning elections and appealing to national pride. Economic justice was considered a precursor to social justice. If the system could be made to work for everyone, if you could lift more people out of poverty, socio-cultural progress would naturally follow. 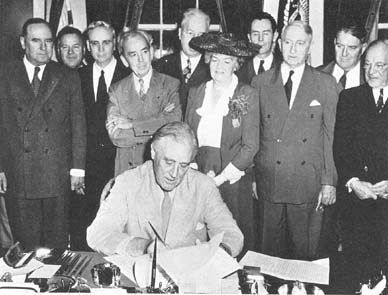 President Franklin Delano Roosevelt signs the GI Bill of Rights. The focus of leftist politics changed in the 1960s. For Rorty, the left ceased to be political and instead became a cultural movement. The prevailing view was that it was no longer possible to promote equality and social justice within the system. The Vietnam War, more than anything else, set the left on its new trajectory. The war was seen as an indictment of the whole system, of America as such. Thus the broader anti-communist Cold War become a central fault line for left-wing activists. Led largely by students, the new left regarded anyone opposed to communism — including Democrats, union workers, and technocrats — as hostile. For if you turn out to be living in an evil empire (rather than, as you had been told, a democracy fighting an evil empire), then you have no responsibility to your country; you are accountable only to humanity. If what your government and your teachers are saying is all part of the same Orwellian monologue – if the differences between the Harvard faculty and the military-industrial complex, or between Lyndon Johnson and Barry Goldwater, are negligible – then you have a responsibility to make a revolution. It’s not that these sentiments were wrong; America was, for much of the country, a failed promise. The racial divide was real and socially engineered. The war in Vietnam was an inhuman sham. There was something deeply troubling about the structure of American society. Rorty disputed none of this. From his perspective, the problem was the total rejection of pragmatic reform. The belief that there was nothing in America that could be salvaged, no institutions that could be corrected, no laws worth passing, led to the complete abandonment of conventional politics. Persuasion was replaced by self-expression; policy reform by recrimination. There was a shift away from economics towards a “politics of difference” or “identity” or “recognition.” If the intellectual locus of pre-’60s leftism was social science departments, it was now literature and philosophy departments. And the focus was no longer on advancing alternatives to a market economy or on the proper balance between political freedom and economic liberalism. Now the focus was on the cultural status of traditionally marginalized groups. In many ways, this was a good thing. The economic determinism of the pre-’60s left was embarrassingly myopic. Most of the gains made by the left in the early and mid-20th century went to white males. “The situation of African-Americans was deplored,” as Rorty notes, “but not changed by this predominantly white Left.” The plight of minorities and gay Americans and other oppressed groups was an afterthought. This was a moral failure the cultural left sought to correct. And it did this by “teaching Americans to recognize otherness,” as Rorty put it. Multiculturalism, as it’s now called, was about preserving otherness, preserving our differences; it doesn’t oblige us to cease to notice those differences. There’s nothing morally objectionable about that. As a political strategy, however, it’s problematic. It reinforces sectarian impulses and detracts from coalition-building. The pivot away from politics toward culture spawned academic fields like women and gender studies, African-American studies, Hispanic-American studies, LGBTQ studies, and so on. These disciplines do serious academic work, but they don’t minister to concrete political ends. Their goal has been to make people aware of the humiliation and hate endured by these groups, and to alienate anyone invested in that hate. 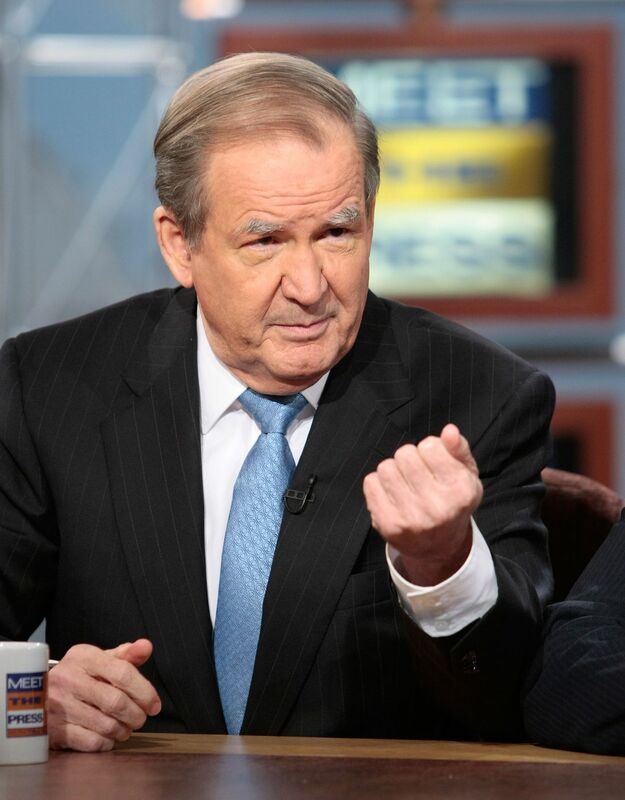 Former US presidential candidate Pat Buchanan at a 2007 taping of Meet the Press. While the Left’s back was turned, the bourgeoisification of the white proletariat which began in WWII and continued up through the Vietnam War has been halted, and the process has gone into reverse. America is now proletarianizing its bourgeoisie, and this process is likely to culminate in bottom-up revolt, of the sort [Pat] Buchanan hopes to foment. The super-rich will have to keep up the pretense that national politics might someday make a difference. Since economic decisions are their prerogative, they will encourage politicians of both the Left and the Right, to specialize in cultural issues. The aim will be to keep the minds of the proles elsewhere – to keep the bottom 75 percent of Americans and the bottom 95 percent of the world’s population busy with ethnic and religious hostilities, and with debates about sexual mores. If the proles can be distracted from their own despair by media-created pseudo-events…the super-rich will have little to fear. Rorty’s concern was not that the left cared too much about race relations or discrimination (it should care about these things); rather, he warned that it stopped doing the hard work of liberal democratic politics. He worried that it’s retreat into academia, into theory and away from the concrete, would prove politically disastrous. And they would be right in at least one sense: On a purely political level, the left would have failed. There’s much to dispute in Rorty’s endogenous critique of the left. To begin with, his distinction between the reformist left and the cultural left is overly simplistic, as is his discussion of the compatibility of these projects. It’s also unclear how neatly the left, as it’s constructed today, fits into Rorty’s binary distinction. Much of his argument stands, but the political landscape has changed dramatically. Rorty is also strangely sanguine about the race question. There’s a causal connection between the injustices of the past and the injustices of the present that makes history impossible to avoid. And one could argue that Rorty fails to appreciate just how entrenched racism is in this country. At times, moreover, he seems to imply that the cultural strides made by the post-’60s left could have come about another way, and yet it’s never clear how. And if, as he admits, the gains of the pre-’60s left fell mostly to white males, was a revolt not justified? There is, finally, Rorty’s praise of the reformist preference for working within the system. His point that this is how things get done in a constitutional democracy is well-taken, but the strategic value of such an approach has to be reexamined in light of the public’s weakened faith in that system. Confidence in the institutions of government has fallen precipitously in recent decades. Trump, after all, was elected precisely because he threatened to explode the system. As a matter of strategy, then, it’s not clear that Rorty’s argument holds. At the very least, it was more compelling in 1998 than it is today. For the Right never thinks that anything much needs to be changed: it thinks the country is basically in good shape, and may well have been in better shape in the past. It sees the Left’s struggle for social justice as mere troublemaking, as utopian foolishness. The Left, by definition, is the party of hope. It insists that our nation remains unachieved. In this dynamic, the right is “spectatorial and retrospective,” and the left seeks to mobilize Americans as agents of change. The right exalts and papers over America’s past, the left acknowledges that past but enjoins Americans to take pride in what the country might become. A candidate like Trump upends this dynamic: He’s both a nostalgia candidate (“Make America Great Again”) and someone who describes America as a carnage-filled hellscape. But Trump is an outlier; his victory represents a negation of the entire system, not a fundamental shift in how the right talks about America. It’s possible that Trump’s rise does signal such a shift, but it’s too soon to make that determination. In any case, Rorty’s pitch to liberals stands, and it starts with the symbolism of the phrase “Achieving our Country.” The words are borrowed from James Baldwin, the great novelist and activist, but Rorty read them through a distinctly Nietzschean prism. Much of Rorty’s scholarship was influenced by Nietzsche, and his political philosophy was no different. Whitman thought that we Americans have the most poetical nature because we are the first thoroughgoing experiment in national self-creation: the first nation-state with nobody but itself to please — not even God. We are the greatest poem because we put ourselves in the place of God: our essence is our existence, and our existence is in the future. Other nations thought of themselves as hymns to the glory of God. We redefine God as our future selves. It has to be said that Rorty’s discussion of Dewey and Whitman verges on the quixotic. 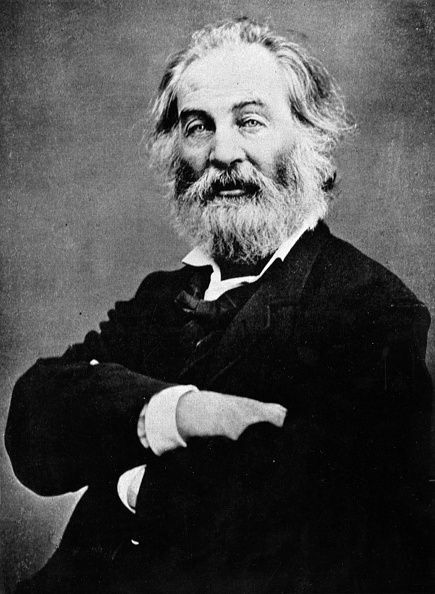 Politics is an ugly business, and the soaring rhetoric of Whitman only takes you so far. But the broader point about national pride and projecting a vision of the future that can build a consensus for specific reforms remains as relevant as ever. Recent history seems to support Rorty’s contention. Obama’s implacable optimism inspired the country. Bernie Sanders’s economic populism resonated with far more people than anyone supposed a year or two ago. This is a winning combination for the left. It’s also the formula that Rorty endorses in Achieving our Country. Perhaps the left would do well to embrace it.